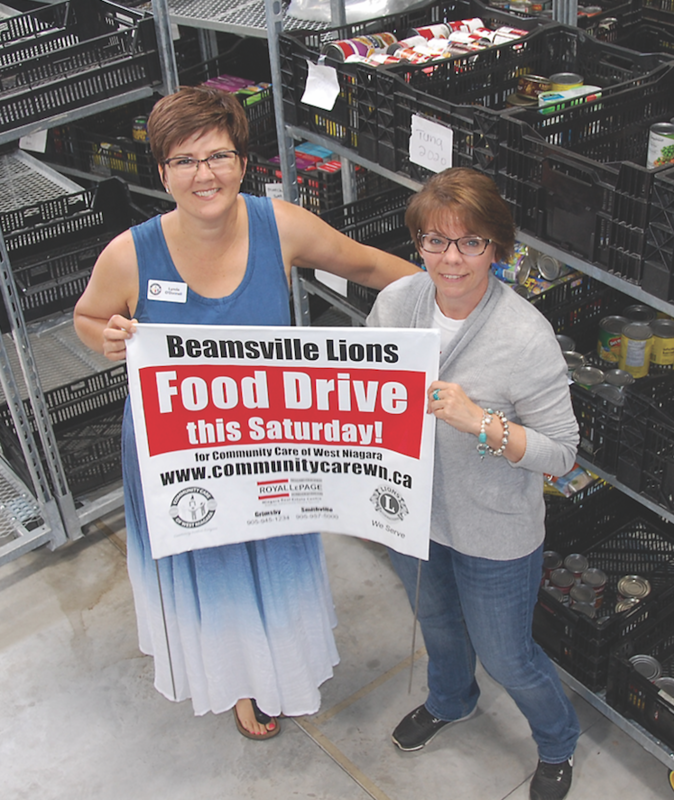 The Beamsville and District Lions Club Food Drive is set for Saturday, Sept. 22 and it can’t come fast enough for Community Care of West Niagara. The summer has been a drain on much needed supplies and the 29th annual food drive will restock shelves and help CCWN meet the needs for so many people in the community. The annual food drive brings the community together in a busy and fun-filled day and there are many who will be grateful for the generosity of their neighbours. It’s the largest food drive in the area and the community working together helps CCWN to meet the continuous challenge and ensure that no one goes without the basic necessities. “We are hoping to collect 30,000 pounds of food which will give us a bump of about 40,000 meals for the clients we serve in Lincoln,” said Carole Fuhrer, CCWN executive director. O’Donnell said it’s a fun day for the community, to feel part of something bigger and to help their neighbours. “If everybody pitches in a little it will be great.” Families, church groups, service organizations and businesses are all encouraged to meet up and work together. The call is out for 150 plus volunteers to help collect, unload and sort food that day. Volunteers must fill out a form to participate. The forms can be completed online or downloaded and returned to the CCWN office at 4309 Central Ave., in Beamsville. Sign up early to be able to state your preference for a volunteer position for the day. The Lions organize road crews to pick up donations from the doorsteps across Lincoln and bring it back to sort, weigh and take to the CCWN warehouse. On the day of the drive, volunteers are asked to meet at the Lincoln Community Centre at 8 a.m. Opening remarks are scheduled for 8:30 a.m. The Centre is located at 4361 Central Ave., Beamsville. Residents are asked to put the non-perishable donations outside their front doors by 8 a.m. and ensure they are clearly visible for volunteer pick up. “The Lions are fabulous. They support us in many ways throughout the year and the food drive is extremely important in filling the shelves,” Lynda said. “The Lions have been doing this for the past 29 years. Each year they organize the road crews to go out and pick up the non-perishable items from across all of Lincoln, including Jordan, Jordan Station, Vineland and Beamsville,” O’Donnell said. Community Care needs a variety of non-perishable items, food, cleaning products, toiletries. Also there’s a gentle reminder to check the best before dates of the food you are donating to the drive. The shelves are bare of many items items and the list is long with a need for canned meats, fish and stews, chili and chunky soups, cereals, crackers, peanut-free lunch snacks, cans of fruit and fruit snacks, jams, peanut butter, pancake mix, coffee, tea, hot chocolate, Boost, flour, sugar, brown sugar, cake and muffin mixes, tketchup, mustard, may salad dressings, olive oil, toilet paper, paper towels, soaps and cleaning supplies, shampoo and deodorant. CCWN has already been blessed with an abundance of pasta and pasta sauce, so those are not priority items at this time. “We have people who support us all year, but this is our one big push to fill our warehouse and help fill the food room shelves through the year,” O’Donnell said, adding the push is on to surpass the 26,000 pounds of food collected during last year’s drive. “We’re touching the lives of so many people and help them to have food on the table while they pay for housing and living costs,” O’Donnell said. For more info, call CCWN, 905-563-5822.